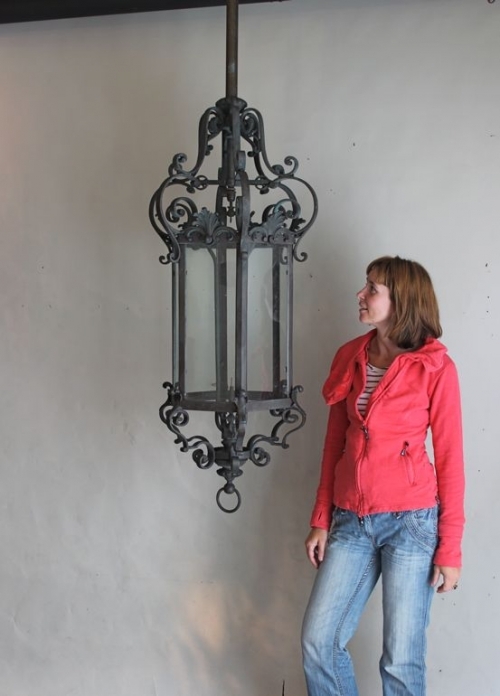 Look for the type of lights you want on line on our website . You will notice that all the lights have measurements given. These measurements are generally (unless otherwise specified) from the top of the light to the bottom of the light and include the ball or finial. Measurements do not include chain or hook plates shown in the pictures because these items can be varied to suit. Measure your ceiling height . If its 9ft then a 3 ft chandelier isnt going to work, but it will on a 10,11 or 12 ft ceiling. If your room is very wide then try to find a chandelier in excess of 75 cms in width, these are hard to find but not impossible, some of the mid century chandeliers and hanging lights are wider because they were made for lower ceilings. Once you have determined these measurements it is possible to cut a piece of card to the size of the item you have in mind and suspend it. Lighting dealers will want to know the length of chain you require and the flex to connect it needs obviously to equal that length. It is easier to have the correct length of flex at the outset rather than after the chandelier has been delivered. Ensure your chosen item has a ceiling plate, sometimes chandeliers and lanterns come with them and sometimes we provide from stock. . Please call us for advice , we are happy to help with suggestions and know it can be difficult. Lastly if its a big one measure your door openings !